I ended up with this Thai mudmee cotton quite unintentionally. I had bought it for the shop but on closer examination discovered that it had a couple of faults so I had to use it myself. What a shame, eh? In the photo above you can quite clearly see the faded patches, which I unthinkingly placed pretty much exactly at my bust. But back to the beginning. This is McCalls 6702 View C, minus the pocket but with View D length. I am actually surprised by just how much I like it. Of course this is after basically reducing it down one size while making it. On top of the usual lots of ease there is actually more ease than stated as the finished garment measurements are wrong. Oh, and it is definitely tunic length (like nearly low thigh as opposed to mid-thigh) and I’m 172 cms or about 5’7″. It is remarkably comfortable and I think a lot of that may be down to the two piece sleeve. 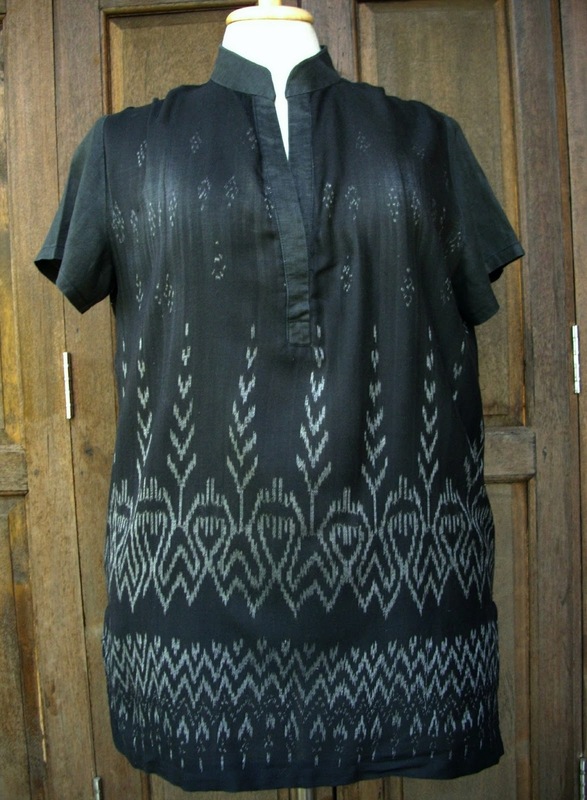 As you can see, I used a solid black lightweight linen for the yoke and front of the sleeve. Purely because I didn’t have enough of the mudmee. It also matches better than it looks here – we all know what it’s like to photograph black, don’t we? You can also see a few stray threads. This cotton, while beautiful in most respects, frays if you so much as look at it. And yes, there are threads poking out of my otherwise lovely french seams, which I did everywhere, even on the armholes. 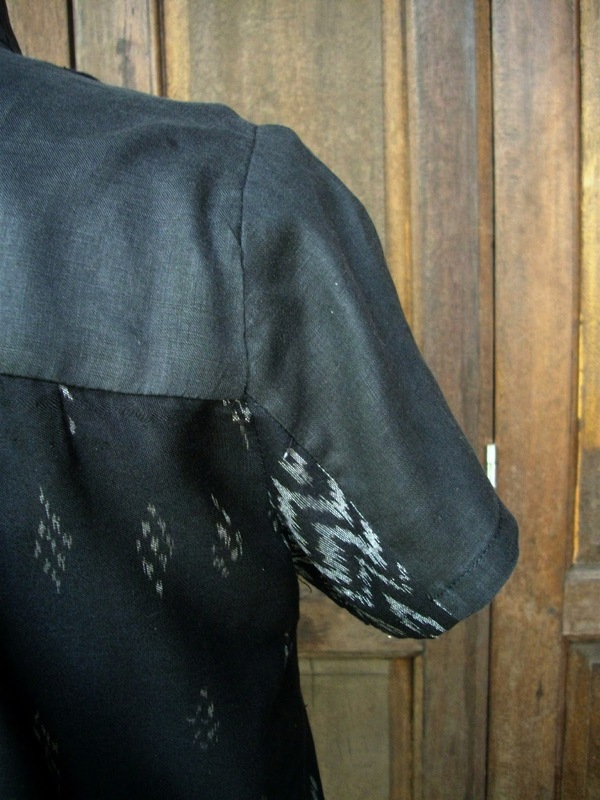 The placket is also solid black lightweight linen, although the less said about it the better. The collar shape is just off and the topstitching isn’t too flash either. Most of these problems were caused by my far-too-stiff interfacing. But it was the only one I had in black so I used it anyway. That placket is also seriously long. I handstitched it closed to make it decent. On the next versions, of which I think there may be a couple, I would probably just add buttons and perhaps even buttonholes. Although since they wouldn’t need to be functioning, I may be too lazy for that. I also think I will move the shoulders forward. As it stands the yoke finishes at the shoulder seam – as you’d expect. But that also means that the gathers sprout directly from the shoulders. I think they’d be better moved down some. And I’ll probably make them tucks not gathers. I’m not really a gather type of gal. I also can’t stop thinking about a shirt dress version. I reckon it would make a great shirt dress. I have looked at so many shirt dress patterns and there’s something ‘wrong’ with all of them. Either they have a waist seam (no thanks) or lots of pockets (safari style) or a retro vibe (not my thing). Plus of course I already have this pattern and would only have to add a little length – an easy adjustment. What do you think? You may also have noticed from the photographs that I have a new sewing friend. I was passing a shop in Chiang Mai and saw a ‘plus size’ dressform. Miraculously, she shares my bust and waist measurements although her hips are bigger than mine. This seemed so serendipitous that I just had to bring her home. I think she’s going to be a tremendous help. So what do you think of this as a shirt dress? Good idea? Bad idea? I’m also open to ‘perfect’ shirt dress pattern suggestions. Yes, yes! 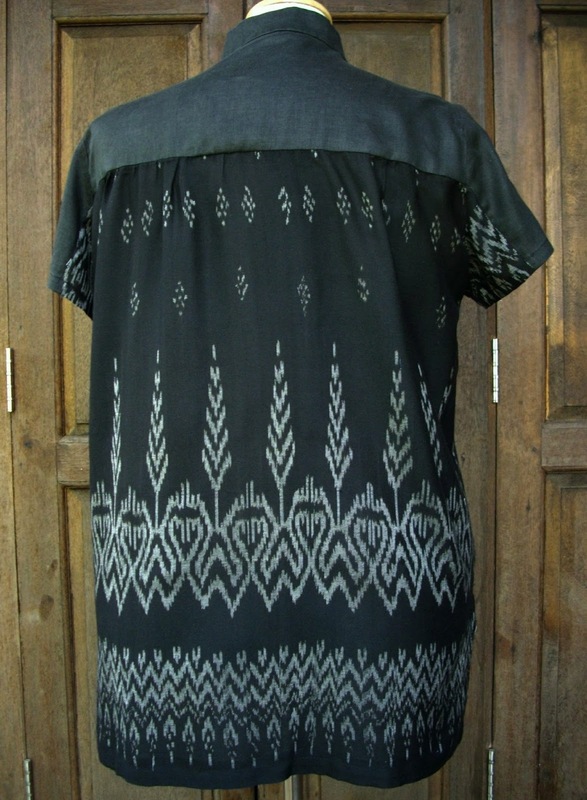 This would make a great shirtdress – I love the shape and your ideas for the tucks vs gathers and front yoke. I'm inordinately fond of shirtdresses. It's a nice pattern and I like the two-piece sleeve and neckline and opportunities for contrasting fabric. I'm glad that you can see it too and you're right about the neckline (which I really like) and the contrasting fabric opportunities. So that's one more for the sewing list. I think this would make a great shirt dress. And great use of your fabric BTW. Thanks very much Rhonda. Now to choose fabric for the shirt dress version. 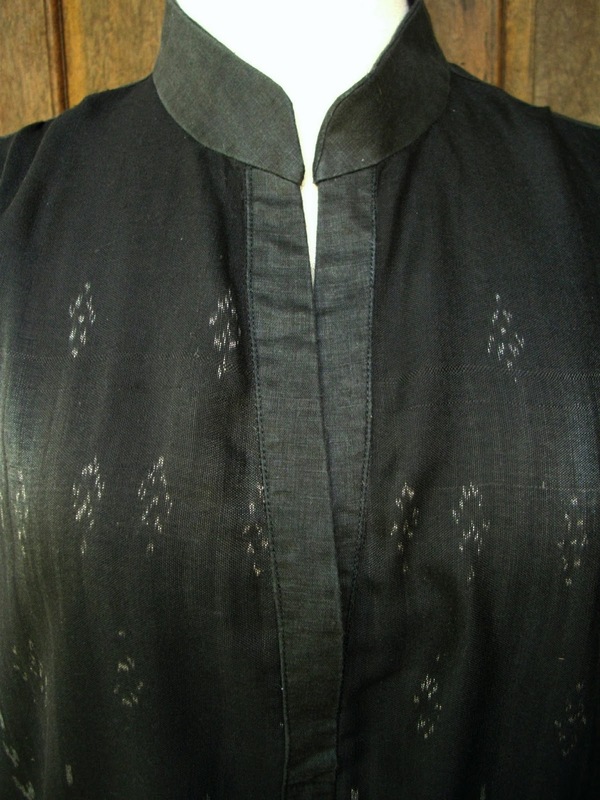 I like the long placket – a few grey or silver half ball buttons would look lovely on it. Ooh, love that button idea! Thanks very much. Great top – love the fabric. I think a shirt dress would be great. Shirt dress – yes, but I can only imagine with a belt or something. Btw the lighter patches are almost as they were meant to be there exactly in that way. Thanks very much and yes, I'm loving the dressform.